When you have clients getting ready to put a house on the market or move to a new house in the Colorado Springs area, they probably have a lot of junk that has accumulated over the years. Help them out by renting a roll off Realtor Property Manager Dumpster from Cubic Hauling. Interior and exterior de-cluttering not only raises the market value of a home but makes the entire moving process and your job a lot easier. A roll off Dumpster rental is a convenient way to clean and get a home ready for sale. Our rental dumpsters easily fit in most driveways and are the perfect size for any home cleanup project. Because of our experience with realtors, Cubic Hauling can help you chose the right size dumpster that fits your client’s property and needs. Let Cubic Hauling help impress your client and help sell your listing more quickly. To learn more call or text us at 719-649-1417! Download printable flyer by clicking postcard below. Need a Dumpster Same Day? We offer same day dumpster drop-offs in as little as two hours! Or schedule a dumpster for any date and we will have it there for you! Affordable Pricing – We give you the price upfront and that’s all you pay! Guaranteed Delivery & Pick Up – Whether it’s same day or a week away! Family Owned – Locally owned. Not a 3rd party or call service! Personalized Help – Let us help you choose the best dumpster for your job! 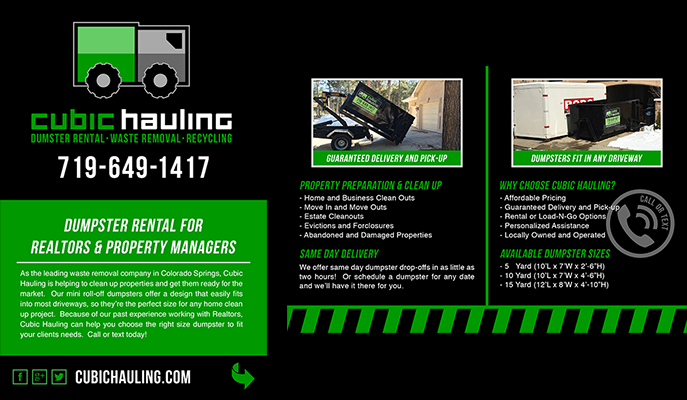 Cubic Hauling offers realtor property manager dumpster rentals in Colorado Springs and the surrounding metro areas. We serve commercial & residential customers for construction cleanup, junk removal, hauling, recycling, waste removal, and more. Call today at (719) 649-1417 for a free estimate!